CHEERS! 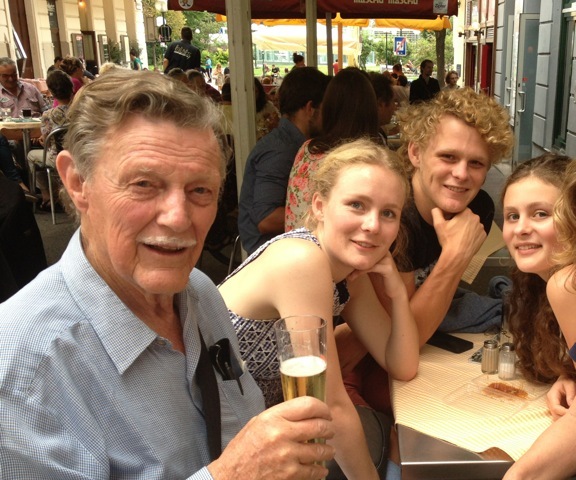 A toast to good times and great grandchildren. ‘Great’ is a ratbag word. I should of course say “clever grandchildren”. They know ten times more about the benefits which ‘digitalisation’ brings to reading than I have learned in eight-and-a-half decades. Nevertheless, my self-imposed task in my ninth decade is to encourage those who never read worthwhile books – or have never had books in their homes – to do so now in any way we can provide text. Our first choice, Bookly – an organisation aiming to provide book-reading on the cheapest of cellphones – has closed down (despite support from Writing Inc and then from Macmillan publishers and Cambridge University Press). We shall therefore contribute part of any profit from these three books to projects promoting reading at the internationally-known Enlighten Education Trust. 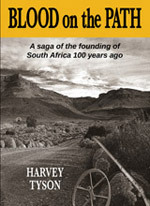 Harvey Tyson is a would-be retired writer who, after travelling round the world several times, finds Hermanus on the edge of Africa the best place on Earth. However he suffers from ‘writing itch’ which makes fishing, whale-counting and shark-diving impossible. This is fortunate, but it also handicaps his hiking, biking, birding and golf. Worse, he is obsessed with a campaign to convince 50 and 15-year-olds that reading is the richest, and most rewarding hobby any woman, child and man can have. Time is short and life is tough in Hermanus. Who knows who one is? This one wished he truly knew. Perhaps it might cause one to pause if one re-read some Curriculum Vitae — those unbalanced and selective documents designed to persuade potential employers; clients; friends; possible lovers or readers of books. Perhaps the following inside-covers of three books may provide insights into, or side-lights on, the nature of the inhabitant of this Website. First, the inside cover of an unavoidably serious saga, Editors Under Fire, published by Random House, in 1993. Harvey Tyson reported daily on the birth, life and incipient death of apartheid. He interviewed Smuts and Malan as apartheid became official policy in 1948, and talked to both Mandela and de Klerk as it began to crumble in 1990. In a journalistic career scanning more than 40 years (by 1990) Tyson worked on nine different newspaper including five South African dailies, The Times, London and The Scotsman Edinburgh. He also corresponded for a number of other international media. He was an assistant editor of The Daily News, Durban and The Argus, Cape Town and was for 16 years editor-in-chief of the largest daily in southern Africa, The Star, Johannesburg. He was a political correspondent for several years and studied economics on sabbaticals at Oxford University and the University of Cape Town. For the past 20 years Tyson’s main preoccupation has been the threat to freedom of speech. He has addressed international conferences in Canada, Spain, Holland, Italy, Turkey, the United States and Britain. In 1987, against the wishes of state president P W Botha, he convened a conference in South Africa on “Conflict and the Press” supported by leading newspapers in 17 countries including some from behind the Iron Curtain. In 1990 he was jointly awarded the SA Union of Journalists’ highest honour for ‘defending the press’s freedom in its most threatened hour’. But why don’t CVs document the important things in life? Mine should record that I once won the Argus Newspaper staff’s national golf trophy using a double digit handicap. And was awarded yet another trophy the following year! ( It was for the longest, worst round of golf on record.) My CV should have noted that I raced in the annual ‘Roof of Africa’ car rally ten times (and- every single year we crashed at least once in the race or, with me navigating, got temporarily lost in the mountains). My CV carefully omits all mention of the fact that I was adjudged in the 1990s to be the oldest, at 67, to climb Kilimanjaro from the back via the great Breech Wall (not on the tourist routes where nice people go). Best of all, I almost stayed up there… No-one ever tells you the hardest part is getting down. Harvey Tyson was definitely born… He was dubiously bred. Though groomed for the Church he was called to the bar, and there he fell among newspaperpersons. As a young reporter he enjoyed an interesting life, interviewing jailbirds and meeting many of a species that is almost extinct today — Beauty Queens. But journalism palled when he was promoted to political correspondent and forced to forage among birds of prey such as Verwoerd, Vorster and P W Botha. He flitted hither and thither, from branch to branch of Argus Newspapers, migrating to other feeding grounds in the Northern Hemisphere. He was caged in Johannesburg for 20 years, for all but 40 months of that time as editor of The Star newspapers. When his release came he was sent to be educated by some of South Africa’s finest birders, among them that grand gentleman of bird artists, Ken Newman. But all attempts to teach him failed, as his writings on the subject have subsequently shown. Nonethless, he proudly boasts that he is a Founder Member of the PPPP — the Pitta Patta People’s Party, whose members have crawled on their bellies through the undergrowth for sight of an Angola Pitta, and stayed up all night in hopes of seeing a mossie (common sparrow) fall. The third CV sample is from James Clarke’s Blazing Saddles, first published by Jonathan Ball in 2007. This hilarious story of a dubious team of journos setting out on bicycles in their aging years to discover the lighter side of Darkest Europe is being periodically updated by the indefatigable columnist Clarke, and can be found at Kindle books http://www.amazon.co.uk/James-Clarke/e/B001HPMLU4/ or his website www.jamesclarke.co.za. I shall try to post a sample of Blazing Saddles somewhere here if I ever get a small grip on the art of how my WebWizardWoman makes this website work. Harvey Tyson was one of the longest-serving editors of The Star in Johannesburg (1974-1990). He was born to the sound of roaring lions (Johannesburg Zoo was round the corner). Following a decade at Kingswood College, Grahamstown, he ‘passed out of Rhodes University after a year to join the university of life’. He was a journalist for 50 years [it’s more than 65 years, but journalists can’t count – ed] and he edited The Star through the bitterest of the apartheid years. He has authored several books, serious and humorous. He continues to travel extensively, although he is semi-retired in Hermanus, Cape where he keeps finding golf balls. Rex Gibson – former editor of the Rand Daily Mail and the Sunday Express. He retired in the 1990s as deputy-editor-in-chief of The Star. He was born in Salisbury, Rhodesia (now Harare, Zimbabwe) and is the author of some very serious books. Now retired to Hermanus where he keeps losing golf balls. Now that’s biographical writing for you. James Clarke demonstrates the best length for any biography and the right depth. He even sums up, in a bouncing ball, one of the poignant mysteries of life. Harvey Tyson is definitely retreating into retirement for the third time. He remains illiterate on Twitter and resolutely unable to read Facebook. If you would like to contact him please do so via Writing Inc.